Prepare for the 2012 Summer Olympics with these Olympic Party Ideas Worthy of a Gold Medal! Windy City Novelties shares tips on how to celebrate the Summer Games in true Olympic fashion. With the start of the Olympics comes a time to have a get together with friends to watch some favorite events or to take in the excitement of the Opening Ceremony. The 2012 Summer Olympics are just a few weeks away and millions of people across the world are planning to watch the Summer Games happening in London. Around 200 countries will compete in 26 sporting events in order to prove their athletic skill and hopefully receive a gold medal. Spectators love the Olympics and many have a favorite event that is a must-see, like swimming or the marathon. With the start of the Olympics comes a time to have a get together with friends to watch some favorite events or to take in the excitement of the Opening Ceremony. There are many options for an Olympic themed party ranging from an indoor watch party to an outdoor barbeque. Windy City Novelties offers some party ideas to prepare for this year’s games. Transform a backyard or living room into an Olympic village with Olympics party supplies and decorations. 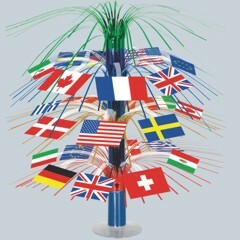 A neat idea for decorations is to use international themed décor, featuring many world flags. The true spirit of the Olympics is friendly competition between nations to foster international peace. Hanging up many different world flags is a great way to highlight this. Another idea is to use symbols of the Olympic games, like the Olympic rings, torches or the sports pictograms. If the group is rallying for Team USA, consider using American flag patterns in the paper goods and invitations. Since the games are in London this year, it could also be a good idea to incorporate the British flag or a British theme. If guests want to get in on the action themselves, then set up a mini Olympic competition. Any number of backyard games can be selected, such as horseshoes or volleyball. Guests can form teams and play against each other for prizes, such as replica Olympic awards and trophies. Sports themed party favors like water bottles or Frisbees make good giveaways and thank you gifts for the guests. The ceremonies begin in late July and continue through August. It may be possible to record events that happen on separate days in order to watch them together. The Opening Ceremony may be the best time to stage a party, since all the competing countries and athletes gather together. Also, there are usually stunning shows to get the audience in the spirit of the games and showcase the culture of the host country. This event also takes place at night, rather than during the daytime, making it easier to plan, though weekend events may be an opportune time to watch as well. Set the stage for an Opening Ceremony party by hanging decorations such as stadium scene setters and international flag whirls. Serve the party guests using stars and stripes paper goods including plates, napkins, and cups. The most important thing is to have fun, support the Olympic camaraderie, and cheer the participants on for the gold! Windy City Novelties, a party supply company founded in 1983, is known for their great selection and competitively priced items. They have an A+ rating from the Better Business Bureau and are also a NexTag 5 star Seller. From their website, windycitynovelties.com, they offer fast and friendly shipping along with great customer service. From glow sticks to balloons in every color of the rainbow, and even a vast selection of costumes at the best prices, Windy City has over 15,000 products and adds more each week.